Foundation Fundraising Auction Needs You! Preparations are underway for the 2nd Annual NGAP Fundraising Auction benefitting the APA’s new Safety & Education Foundation. The event will be held Friday, October 9 in Denver as the finale event of this year's convention. 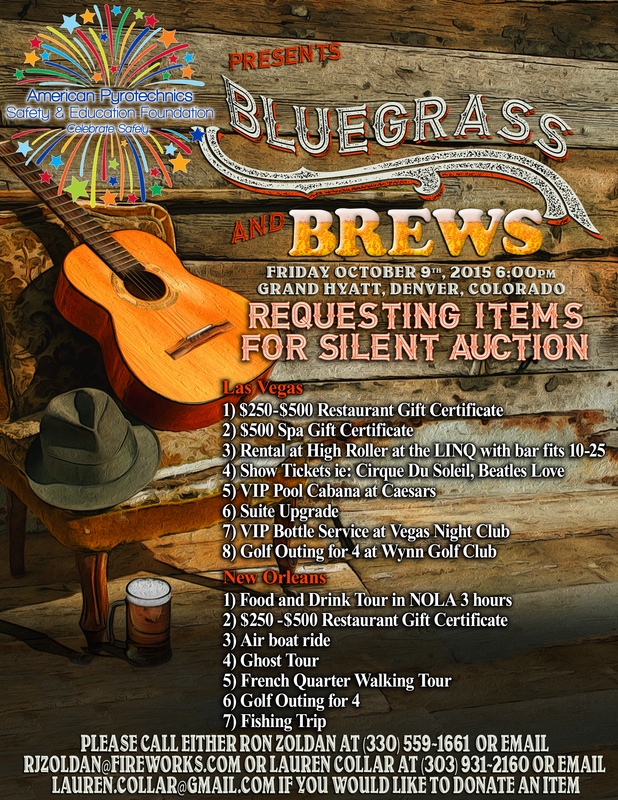 Attendees will enjoy a Bluegrass & Brews themed dinner and musical entertainment and you won’t want to miss the fun-filled auction with many special one-of-a-kind items and experiences up for bid. The NGAP Committee is seeking donations. Please take a look at the list above for ideas (or come up with your own) and contact either Lauren Collar ([email protected]) or Ron Zoldan ([email protected]) if you are interested donating an item. The American Pyrotechnics Safety & Education Foundation was founded one year ago as an educational initiative to instill in young people an understanding of how fireworks should be use appropriately, discourage misuse of fireworks, and decrease the number of fireworks related injuries in the U.S. The Foundation has contracted with noted public relations firm Widmeyer Communications to develop curriculum kits as a learning tool to be delivered to teachers, administrators, and other youth educators. Foundation Michael Ingram will provide an overview of this effort and the next steps at the Welcome Breakfast in Denver.